Chatting with your friends on Xbox LIVE is easy when you use the Xbox 360 Chatpad. Attach the chatpad to an Xbox 360 controller so that you can quickly send text messages and enter text. Set up is easy. First, connect your controller. The Xbox 360 Chatpad is for use exclusively with Xbox 360 wired or wireless controllers. The chatpad cannot be used on a controller that is connected to a personal computer. 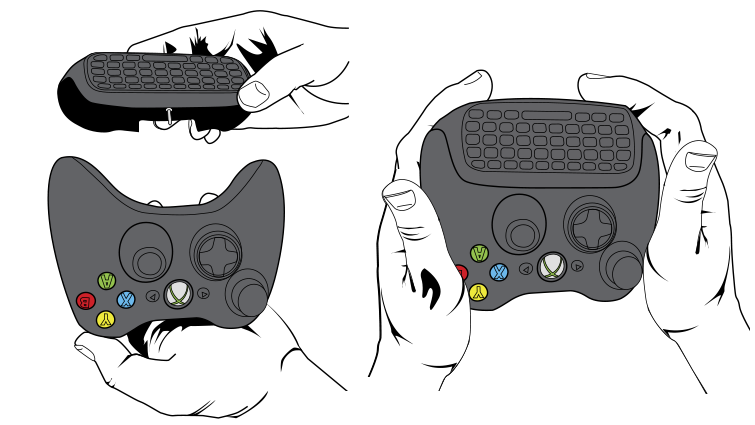 Before you connect the chatpad to the controller, make sure your Xbox 360 console is up to date by connecting to Xbox Live. Make sure that you turn off your controller before connecting the chatpad to ensure that you don’t accidentally press any buttons. Grasping the controller in both hands, align the chatpad with the base of the controller. You want the connector plug (the metal pin) on the chatpad to align with the controller's expansion port (the little hole). Push the chatpad on to the controller with even pressure from your forefingers until they snap together. You will hear a click when the chatpad is in place, and there will be no gaps between the chatpad and the controller. Note If you have connected the chatpad to the controller correctly, and you turn the controller on, the chatpad’s white backlight will light up when you press any key. If this does not happen, you have not connected the chatpad correctly. Disconnect the controller and try these steps again. Make sure that the posts on the chatpad are lined up with the holes on the controller, and press the chatpad gently but firmly into the controller until they snap together. You can plug an Xbox 360 Wired Headset into the chatpad. Plug your headset into the 2.5-mm audio jack on the chatpad. For more information, see Connect a headset to your Xbox 360 console. Note For detailed information on using the chatpad, see the Xbox 360 Chatpad manual. All the characters on the chatpad are lowercase. Press SHIFT to make a capital letter. Press the Messenger button for quick access to friends. The keys are backlit so that you can type in the dark. Would you like to contact Support regarding the "Set up and use the Xbox 360 Chatpad" issue you were reading about or a different issue?